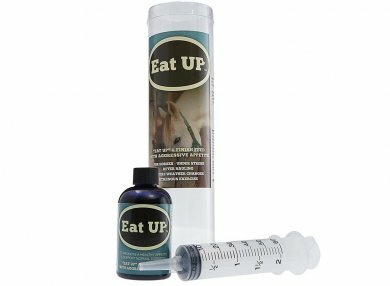 Unique formula promotes horses to “Eat up" & finish feed with aggressive appetite. To promote healthy appetite and support normal digestion. age, size or weight. Mares in foal or lactating. For Equines Only. Shake bottle, pour in cup, using syringe, draw back. Place doser deep on side of mouth with head tilted upward, squeeze in mouth. Best Stored at Room Temperature. May be stored in trailer or feed room high temps to do not affect product. If freezes just thaw out and use. Laboratory Credentials: Products are manufactured in the USA in an ISO 9001 & ISO 13485 registered facility, which operates in strict compliance with 21 CFR 820 and cGMP Current Good Manufacturing Practices: This means to you - each batch is formulated to exact specifications, assuring quality & consistency. View the full line of Horse Sense Solutions Products.